For evaluating the abrasion resistance of wire or cable, Taber Industries offers the follow options. The Taber® Scrape Abrasion Kit enables you to use Taber's Linear Abraser Model 5750 and T-Slot Table (sold separately) to test the resistance to scrape abrasion of cables and wire. Based on ISO 6722, this accessory was designed to evaluate single-core cables, with a conductor size of 6 mm2 or less, intended for use in road vehicle applications. Note, the maximum diameter wire the holder will accommodate is approximately 6 mm diameter. Two attachments are provided with this kit permitting scrape abrasion with either the 0.25mm or 0.45mm diameter abrading wire. The abrading wire rubs the insulation until it wears through. 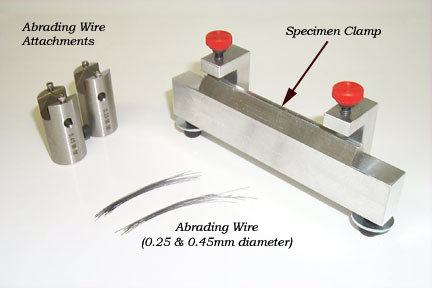 Depending on material properties such as material hardness, flexural modulus and tensile strength, the oscillating wear of the abrading wire on the wire insulation typically results in plastic deformation and displacement; material fatigue (resulting in crack propagation); and / or micro-gouging. Once the abrading needle makes contact with the conductor, the test is automatically stopped. Results are reported as cycles to break-through. Note: Studies have demonstrated that abrasion tends to be less severe if the insulation is thicker. This is because the contact area of the scrape needle is larger, and thus the stress or force applied in the contact area is reduced. To determine the print durability (e.g. markings) on insulated wire or the influence of chemicals when performing a scrape test, Taber also offers the Wire Scrape Attachment. Used in conjunction with Taber's Reciprocating Abraser Model 5900, two attachments are offered with either a 1mm or 0.025 in. diameter abrading needle (rod). The attachment is designed to secure an abrading needle (rod) such that it is oriented perpendicular to the axis of the wire specimen. An optional wire support fixture is available to secure specimen wires during testing. Taber's Wire Scrape Attachment can be used to satisfy test method IEC 60794-1-2. This test method describes two procedures for conducting abrasion tests on fiber optic cable. Method E2A describes a test to measure the cable sheath's ability to withstand abrasion. The test abrades the surface of the cable approximately 10mm in length, at a frequency of 55 cycles per minute. Method E2B describes a test to measure the abrasion resistance for markings on cables. Option one is for rigid markings like embossing, indenting and sintering and utilizes the Wire Scrape Attachment with the 1mm diameter abrading rod. Option two is for other types of markings and utilizes a wool felt to be rubbed back and forth over the markings over a length of 100mm. For this option, the Taber CS-5 Jumbo Wearaser is suggested. The Wire Scrape Attachment can also be used to satisfy MIL-STD-2223 Method 6004 to determine the durability of printed identification markings. This method utilizes the 0.025 inch diameter needle. 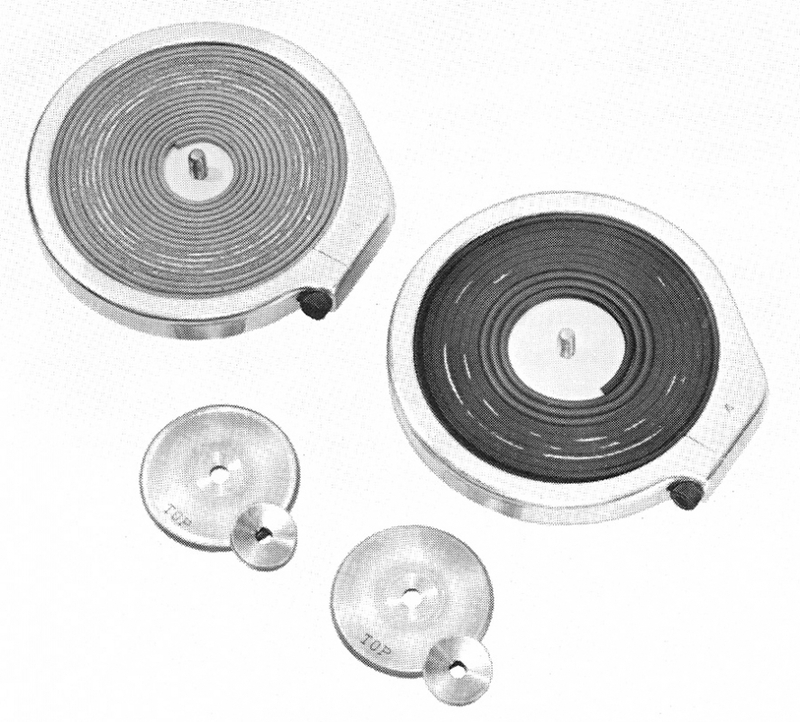 For tests that require an automatic stop when the insulation has been abraded to the wire, the Wire Scrape Attachment can also be used with Taber's Linear Abraser Model 5750 and Scrape Abrasion Kit (described above). Another option to evaluate the abrasion resistance of insulated wire is to utilize the Taber Rotary Abraser. Molding the insulation material into a test plaque is ideal, however there is a method that will allow you to test insulated wire. The coiled wire specimen, mounted on the specimen holder, is placed against a flat surface and weighted with approximately 5 pounds for 1 hour. 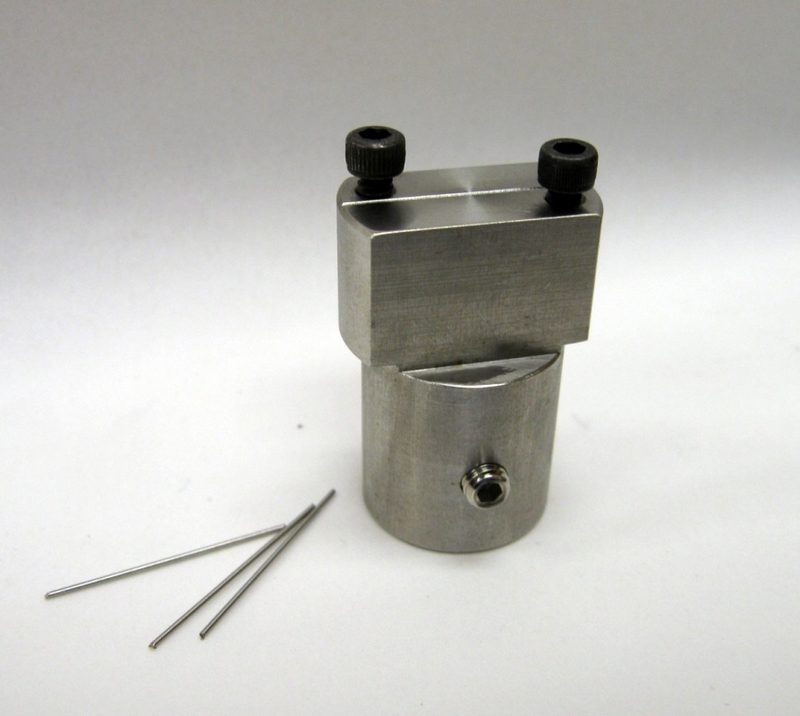 Prior to testing, the specimen holder clamp plate and clamp ring are attached to the holder. To prepare the specimen, an S-36-1 mounting card is placed on the specimen holder and secured in place with the hold-down ring. The specimen wire is wound in a clockwise direction, in a flat spiral, outward from the center to the edge of the specimen holder. Test end-point occurs at the first sign the abrading wheels have worn through the insulation to the wire. Use of an electrical current to detect the end point automatically, is also possible. One end of the specimen wire may be grounded and a soft wire tinsel brush, in contact with the wear path, is connected to a suitable electronic switch to stop the abraser when the insulation breaks-through and the wire is exposed.